This weekend, all you Barn Sale shoppers will again have an opportunity to participate in a drawing from Laurel Ridge Antiques and Christmas in historic downtown Gonzales. A visit to Laurel Ridge is like taking one huge luxurious step back in time. The shop is found inside of of Gonzales' most gorgeous Historic Homes. You'll find it fully restored and filled to the top of it's 14 ft ceilings with beautiful antiques and overflowing with Christmas charm. During the past year, shop owner Barbara turned the upstairs of the gorgeous shop into an Inn. The layout is perfect- and now customers who have always enjoyed and appreciated her love of antiques can get a feel of what it is like to spend the night with full tester beds, huge armoires and 14 ft. ceilings! All the furnishings are for sale- so if you like it so much you can permanently enjoy them! We were so excited when Barbara called and said she wanted to have a presence in the Barn Sale again this year - she is giving away A Night at the Inn! We are super excited about this! Along with that awesome drawing she will also be doing a separate one for a limited edition 25th Anniversary Lynn Haney ornament. The Lynn Haney Santa collection for this year is gorgeous- you will enjoy seeing them at her shop! Right next door is the cutest little kitchen store around! The Hearty Gourmet- isn't that a great name! Sweet Ruth has a great selection of wonderful cookware, dishes for entertaining- perfect for the holidays, and all kinds of delicious food mixes along with coffee-----just open the door and amazing aromas of all sorts of coffee beans fill the air! A special someone in my family always receives fresh ground Southern Pecan for special occasions during the year from me! Why am I mentioning all of this--------Well, sweet Ruth wanted to get in on the fun as well! 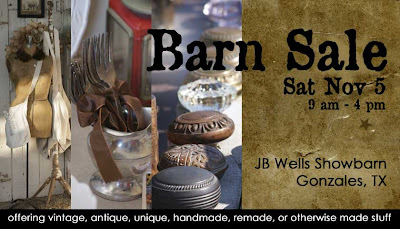 So, she asked if she could put together something grand to have on display at the Barn Sale that guests can come to her store and sign up for as well! As you know I said- Absolutely!!! We love to promote these great shops in our little town and hope that you will enjoy them as much as we do! Just a note- These two stores will gladly accept a credit card . . . However- Many of the vendors at the sale will only be able to accept cash and checks. So- plan ahead!!!! Along with promoting Gonzales- there is something we would like to do as well, which is to support the community. So, we are giving you an opportunity to help us! We would like to help fill the shelves at our local food pantry in time for the Thanksgiving holiday. By bringing 2 canned goods or non perishable food items with you to the sale we will deduct $1 off admission. So think of 2 for 2- Bring 2 canned goods- get in for $2! Sounds like a win win situation! Can't wait to see you!!!!! Need some directions? Click here! What fun! Will make a stop on Friday after setting up. 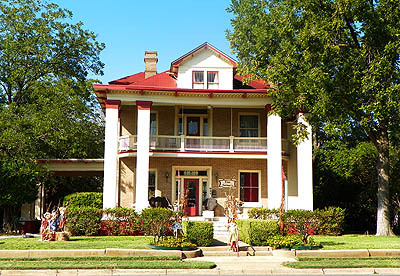 Sisters Treasures have reservations at a B&B in Gonzales. It might be this one.